I’ve been asked one question this week more than any other. Upon hearing (or rather not hearing, as it’s sneakily quiet) that I’ve been driving an electric car, people are curious to know what I thought of the Mitsubishi i-MiEV. Let me be straight about it – I liked it. A lot. Okay, it’s not perfect, but then again, no car is, but overall I found the i-MiEV experience to be a pleasant, easy and often rewarding one. Completely contrary to my expectations. 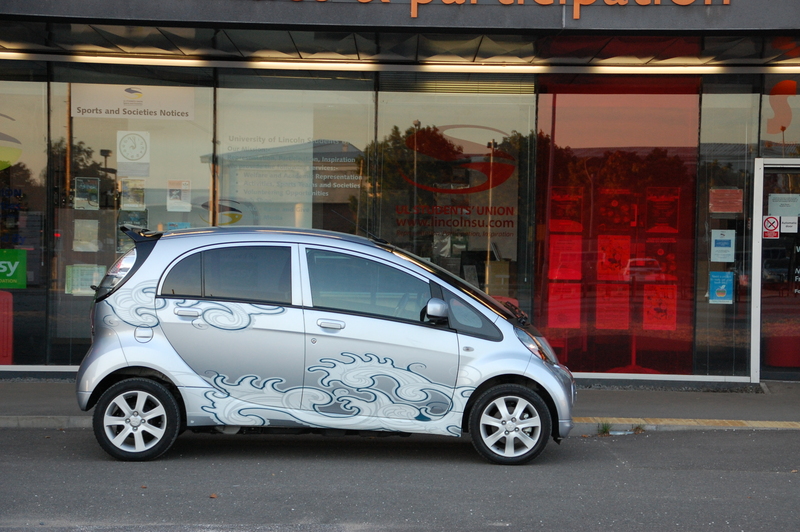 It looks rather unusual doesn’t it, the i-MiEV, and not the sort of thing you see frequently either? Whether you like the looks or not, most would agree it appears contemporary, perhaps even a little futuristic. Yet, the body shell has been on sale in Japan since January 2006, where its diminutive dimensions help it fit into the compact Kei-class category of small cars, which get various tax breaks in its domestic market. This current (pardon the pun) electric i is the smallest Mitsubishi’s second bite of the UK-market cherry too. From the summer of 2007 the i was sold for a couple of years with a 660cc petrol engine mounted at the back, under the boot floor – the same location now used for the electric motor on this version, the batteries being housed low in the chassis to produce a low centre of gravity. The mechanical packaging and, to some degree, even the appearance give off more than a whiff of being like a larger version of smart’s fortwo city car don’t they? Maybe not surprising given smart’s parent company, DaimlerChrysler (as was), was working in collaboration with Mitsubishi at the time. Only the two companies know for sure what was the plan was – the eventual smart forfour that reached the market was based on the larger Colt, instead of the i.
Electrically-powered cars have been a small but recurring theme in the history of the car right from the start, but this time, there seems to be more determination from a wider variety of manufacturers, to finally break through into the hearts, as well as minds, of car buyers – and not just those with environmental concerns as a prerequisite. Some early adopter brands are going all out with purpose designed models, such as Nissan’s LEAF and the forthcoming Renaults Twizy and Zoe, whereas others, like Mitsubishi, are modifying existing models to utilise the latest technology. 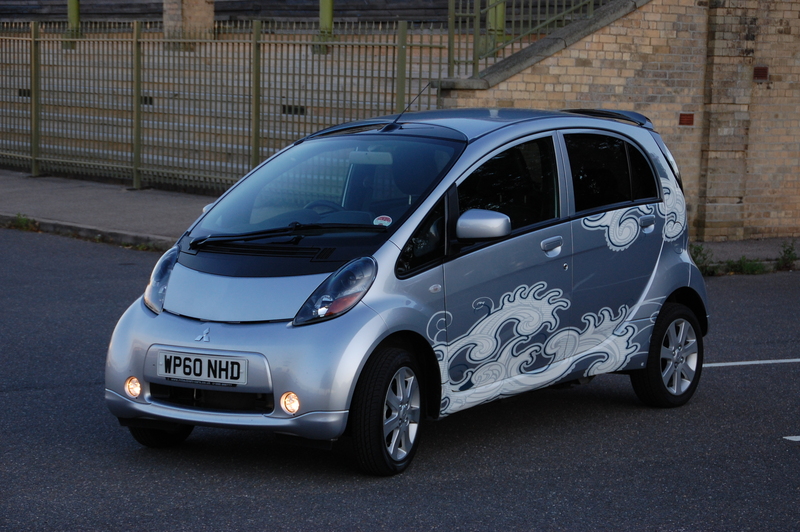 The i-MiEV (Mitsubishi innovative Electric Vehicle if you were interested) is built in Japan, but in Europe market penetration is further enhanced by selling essentially the same model, save for light modifications, as both the Citroën C-Zero and Peugeot iOn. Mitsubishi already has its Outlander SUV sold under both French brands’ banners, so this is a logical extension of the agreement, covering what remains a risky market sector. All three models had their official UK market launches at the start of 2011. 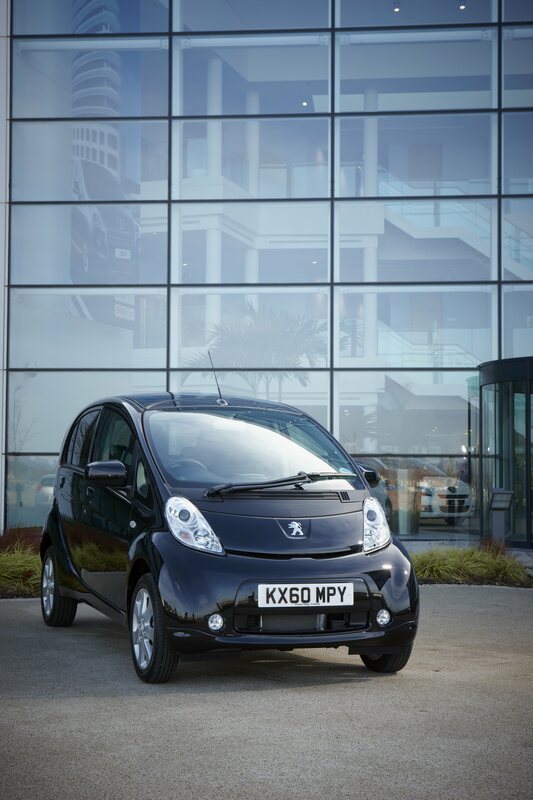 In terms of being a rival to cars of a similar size, the i-MiEV can be compared with the likes of the Fiat Panda, Hyundai i10 and Kia Picanto as well as slightly larger competitors like the Suzuki Splash and Vauxhall Agila. 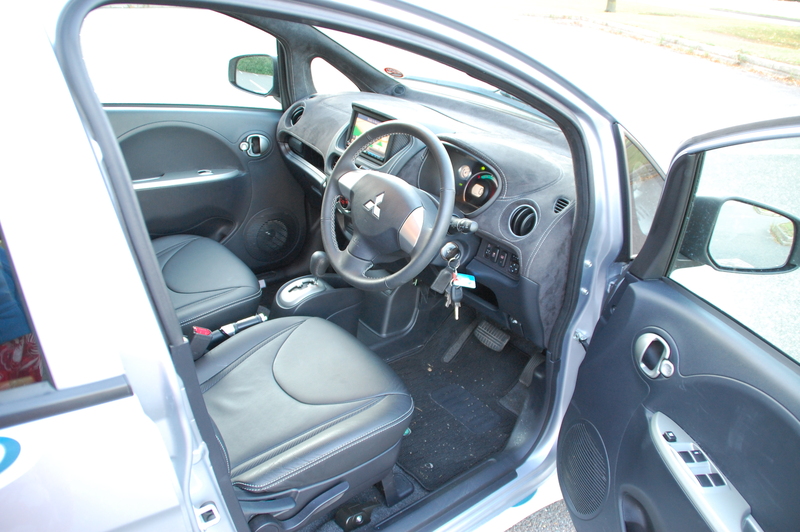 However, all of those are conventionally propelled with front engines and front wheel drive (plus a 4WD drive option on the Fiat) – the i-MiEV’s electric motor powers the rear wheels, which combined with the dramatic cab-forward stance (look how the base of the windscreen is forward of the front wheel axle line), means the cabin is reasonably spacious and airy for four occupants. Those looks are controversial though. From most angles I find it rather cute and attractive. The wheels bulging out of each corner give the impression it’s gripping the road, ready to perform. The ‘face’ is friendly too – in fact the whole thing is remarkably cartoon-like, emphasising the fun nature of the car. Even the best looking cars, those universally admired and acknowledged as being beautiful, have awkward elements to their appearance. For the i-MiEV the longitudinal plane, either straight at the front or the back, let the side down because they can do nothing to disguise its narrowness. At first glance you can imagine a strong wind or a hefty shove would topple it over, which makes the experience of driving it all the more surprising. And don’t worry, those surfing wave (or is it Paisley-esque?) vinyl body side graphics are optional. Most people considering the i-MiEV will be doing so not because of its looks but because it is an electric vehicle (or EV, which I’m sure will become a universally understood set of initials over the next couple of years). Aside from the debates about the real green credentials of such cars, considering how much pollution is created producing the electricity to charge them, one fact remains true – at the point of use, EVs are the cleanest types of car you can buy in Britain today. For some, this will make vehicles of this type the default choice, but for the majority there needs to be a significant development in the infrastructure to make the switch to EVs viable. 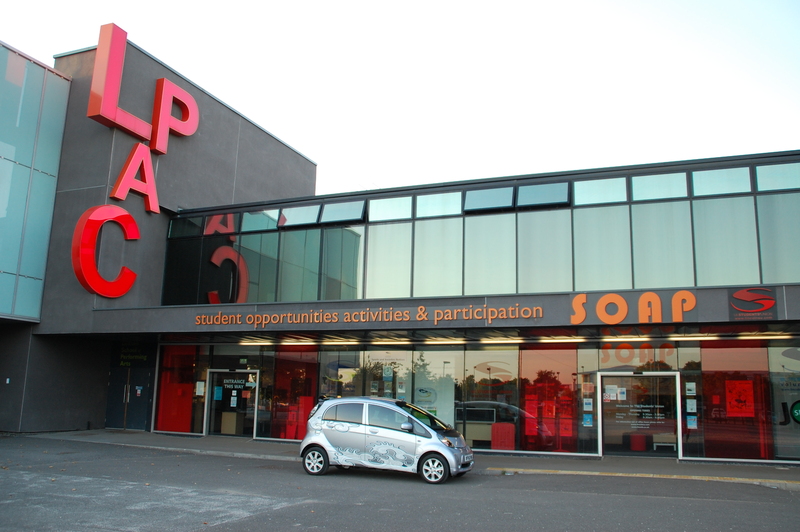 The single biggest improvement required is the installation of charging points, both in public and private car parks – such a transition is not the work of a moment, of course. And as the recent Top Gear episode so ham-fistedly pointed out, Lincoln, like many towns and cities, is a long way from being able to offer such a facility. Generally speaking, people that will benefit most from EVs are those living in sprawling metropolises and larger cities, but conversely, most of the people living in them don’t have housing that’s convenient for EV use – apartment blocks and houses without off-street parking do not make the use of a 5 metre charging cable all that easy. The other, inescapable, downside of purchasing a new EV is the eye watering cost: this Mitsubishi’s list price is £28,990. Yes, you read that correctly. 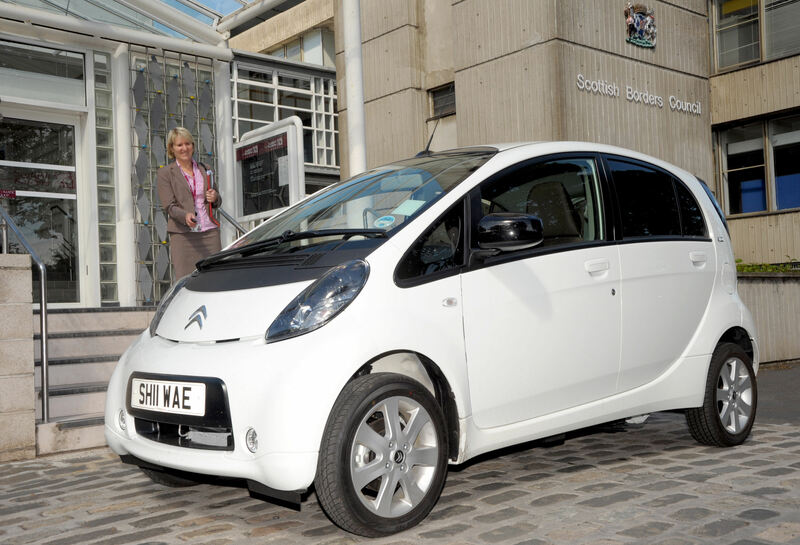 For now, the government will subsidise this with an EV grant of £5000, but for a price in the mid-£20,000s, there is a huge amount of, admittedly dirtier, alternatives. So for those keen on flying the flag for EVs, you’ll have to be prepared to pay a lot for the privilege. Many will baulk at the suggestion but for other types of product innovation, people are prepared to pay higher than usual prices, with later conversion sales paying significantly less. It’s happened with smartphones, games consoles, flat screen TVs and videos VHS, then DVD and now BlueRay players, to highlight just some examples. Will the electric car be one extension of this notion too far? Only time will tell. Might be worth keeping in the back of your mind that when the last petrol engined i was sold here at the end of 2009, the list price was a much more palatable £9539. 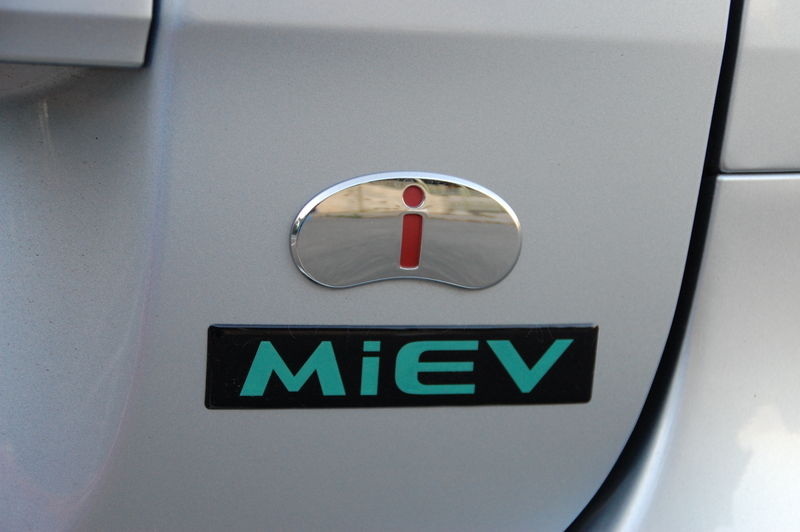 When you open the door to the i-MiEV, you’re in for something of a surprise. Saying, that, it shouldn’t be because if you’re spending this much on a small car, you’d expect it to be well trimmed and fully stocked with equipment. Inevitably, some aspects of the design betray its essentially inexpensive city car origins – the door cards, for instance have the cheapest feel within the cabin, being large, hard, one-piece plastic mouldings, enlivened only by some silvered plastics. That said, they are interestingly shaped and colour-wise match the interior well. The passenger space is dark, yet it manages to eschew the stark and depressing look, instead majoring on tactile pleasure and sumptuousness. The seats on the test care were faced in an optional charcoal grey leather, the same material also shrouding the optional double-DIN Kenwood touchscreen stereo and satnav system, together with a couple of tasteful fillets of faux carbon fibre. Incidentally, that infotainment package is by far the simplest to use I’ve come across in a long time. The rest of the interior, including the dash and entire headlining, is richly swathed in dark grey Alcantara (also an optional extra). The switchgear has a slightly downmarket feel though, with shiny, plasticky knobs, but it all works well enough and is logically laid out to reach down and adjust settings while on the move. 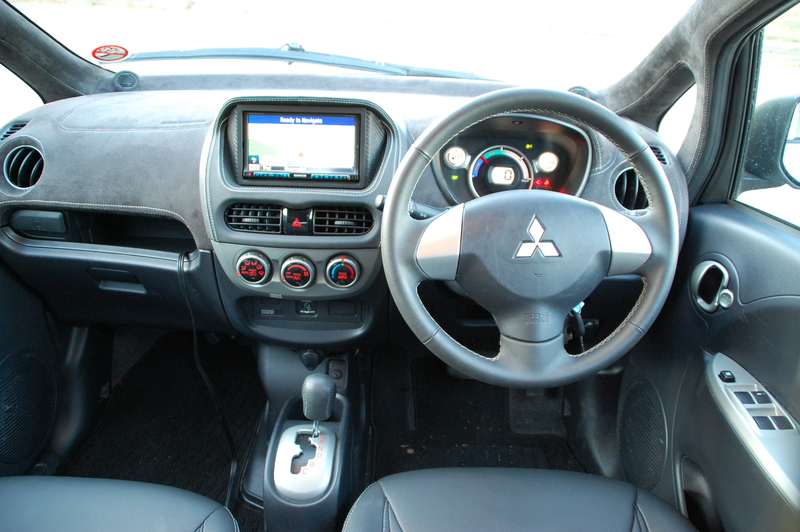 Those Kei-class dimensions make the interior cosy and only designed for four passengers, with no centre rear seatbelt. That narrow body, just 1475mm wide, means it’s a snug experience but not an uncomfortable one. 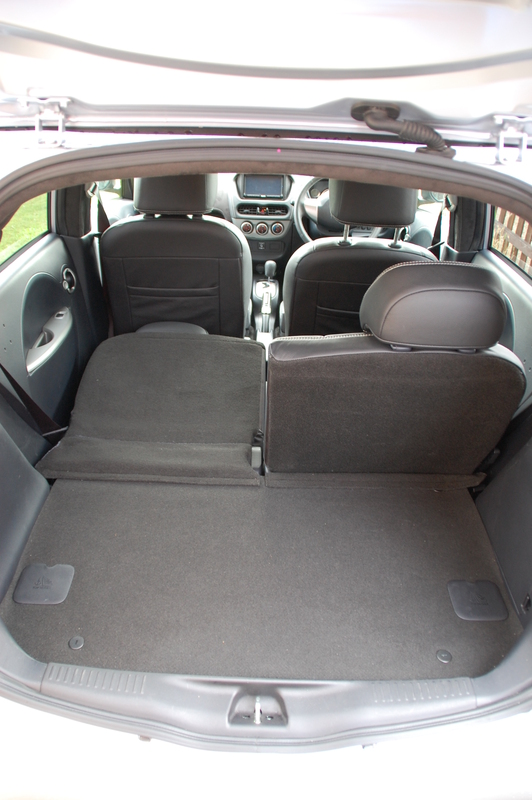 The front space is fine with no sensations of being claustrophobic or constricted in your movements. 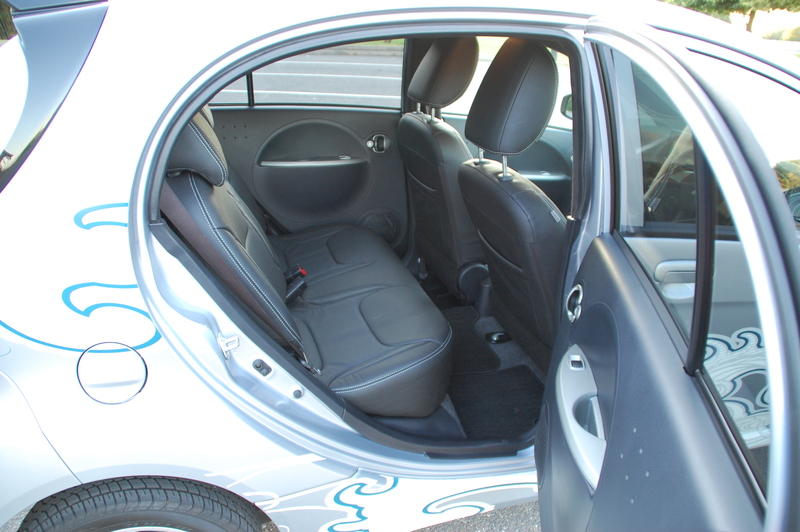 The front seats themselves are comfortable and have a heating function for the chillier months (as part of the leather package option), but they’re a little shapeless permitting some movement on the chairs when the i-MiEV’s being driven with enthusiasm. Rear seat passengers aren’t short-changed either, again the bench is comfortable enough for most trips and while legroom isn’t exactly generous – my knees pressed into the seatback behind my driving position – you don’t need to be gymnast-flexible to be seated well. The backrest angle on each side of the seat can also be adjusted, as can the head restraints. The electric motor and its rearmost location does inevitably impinge on loadspace. The boot is fairly sized for this market segment at 227l, extending to 860l when both sides of the split rear seat are folded flat, although the loading lip itself is quite hight. 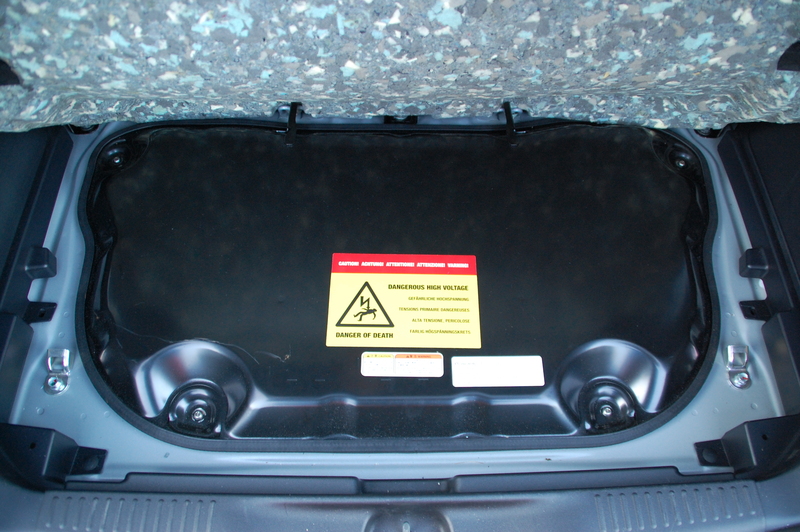 When you need to top up any of the ancillaries, you’ll find those under what must be one of the shortest bonnets of any car on sale. The level of equipment on the i-MiEV is impressive, there being just the single model in the range. On top of the optional equipment on this model already been mentioned, you’ll find climate control, all-round electric windows, electric and folding mirrors, projector beam headlamps, alloy wheels and rear privacy glass. 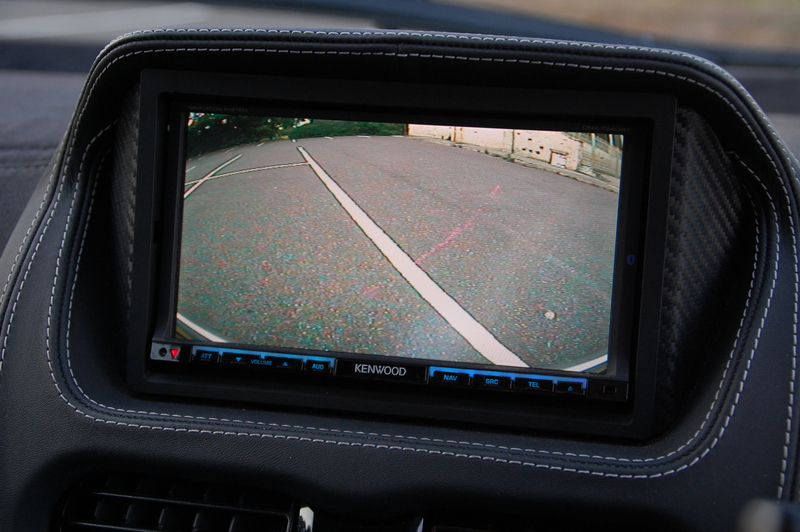 The Bluetooth connectivity and rear view camera with supplementary parking sensors were further, effective options fitted to this test i-MiEV. There’s plenty for button fetishists to fiddle with at red lights, and all in eerie silence and within the safety of a 4 Star EuroNCAP structure. Although I intended to give the i-MiEV a fair opportunity to display its merits, it’s inevitable that never having driven an electric car before that certain prejudices will surface. Chief amongst these was a fear that it might perform something like a household appliance – just like a larger version of the many devices we plug in to charge before whittling away its battery life during a day of use. Also, that tall, narrow physique didn’t look like it would lend itself to being anything other than a nervous handler; despite the wheels being right at the body’s extremities, the narrow-bands of rubber connecting the car to the road looked like the i-MiEV would be as eager to scamper away as securely as a puppy on a polished wooden floor. The first few days I drove it as I would most cars – not hammering it but driving with vigorous enthusiasm. My prejudices were almost immediately eroded. Let’s not get carried away here – we’re not talking about a pocket rocket in the mould of those specialist Mitsubishi imports, the Mirage (née Colt) Cyborg, but we are talking about a small car with vim and character. It responds well to steering inputs, largely by virtue of those front wheels only performing steering functions and no power delivery, but naturally those skinny front tyres do lose traction when pushed. The feel through the chunky steering wheel is positive too, telegraphing most of the conversation between the road and asphalt clearly. Despite the tall, slim stance, it remained resolutely glued to the road on dual carriageways and motorways, humming along discretely at a surprising 84mph flat out. Back roads proved to be engaging too, the i-MiEV being composed and essentially agile as the sweeping bends of the Lincolnshire B-roads opened up to many a Roman-esque straight. Ride quality was better at higher speeds too than at an urban crawl. A drive at sub-30mph wasn’t an uncomfortable experience but the cobbles and patchwork surfaces of many of Lincoln’s thoroughfares sent a momentary shimmy through the car. I suspect that improved damping at urban speeds would promote a wallowing, less confident performance at higher ones, and therefore, given the limitations of the dimensions, a fair compromise has been reached. The two most appealling elements of the i-MiEV’s drivetrain have been left until last: the first is the sheer smoothness of it. If you too have solely experienced internal combustion-engined vehicles, then it’s quite a shock when you turn the key and the noisiest thing your ears experience is an electronic ping to accompany the green ‘READY’ light appearing on the instrument pod. Your initial thought is that it can’t be ‘on’, but wiggle the stumpy little automatic gearlever back from P to D, release the optional Momo handbrake lever and remove your foot off the pedal and serenely and near silently you proceed. The single-speed box works in perfect unison with the electric motor with not even the merest hint of any drivetrain shunt or vibration at all. The second surprising aspect is the one that will impress people the most and a feature that manufacturers of electric cars should promote, as much as permitted, within their marketing campaigns – the acceleration. The brochure figures of a quoted 81mph top speed and a 0-60 dash in a mediocre 13 seconds only tell part of the story. What’s more telling is the 0-30 sprint, most of us will experience on a daily basis. 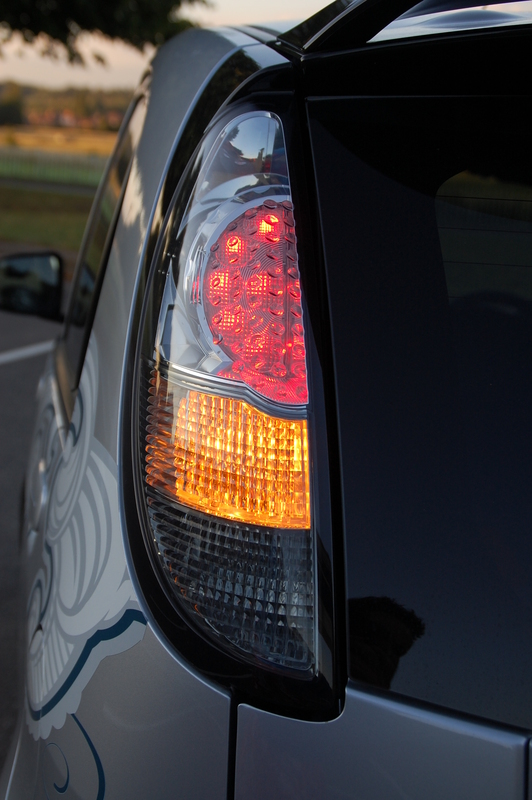 Without at all trying, the i-MiEV outguns most traffic light opponents, but flooring the throttle induces a genuine pinned-to-the-back-of-the-seats sensation. Biggest scalp it had over the week? A disgruntled 330i coupé driver. As he eventually pulled alongside at the next set of lights, he glanced across with a look of indignation, blipping the silky straight six into life… before he was left behind again, listening to the i-MiEV’s whoosh. 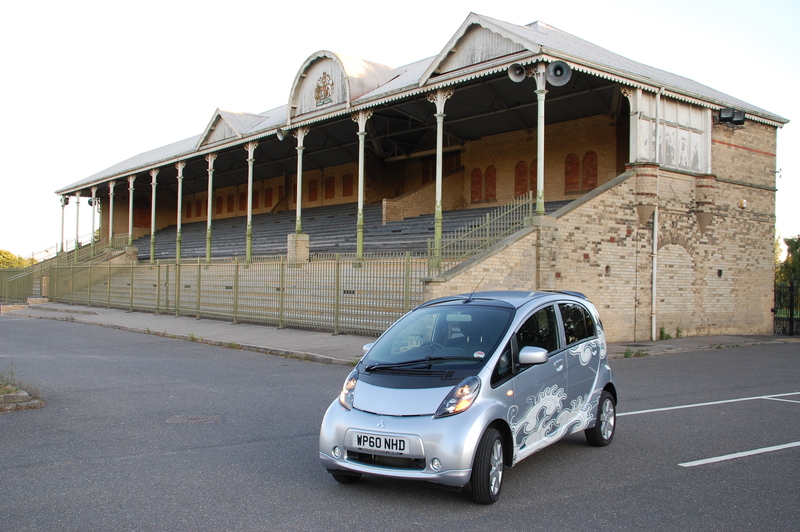 The second half of the week I spent trying to use the i-MiEV purely as a very convenient city companion with the occasional foray further out of town, but without longer countryside exploits. The qualities already described ensured that as an urban runabout, the miniscule Mitsubishi was utterly painless yet charmingly endearing at the same time. Its ease of use cannot be underplayed. Backing off the accelerator and braking helps recover lost energy and the large dial on the instrument panel swings anti-clockwise into the ‘Charge’ zone. The rest of the time, keeping speeds and acceleration sensible and maximising smoothness, ensured the needle barely ventured out of the ‘Eco’ zone, maximising range. Let’s deal with problems that are jousted in the argument against electric cars. Range anxiety is a misnomer in reality for it exists whether your car is powered by electricity, petrol, diesel and chip shop oil. Yes, the frequency at which an EV’s resources will need replenishing is more frequent, nor is the process of doing so a quick process on a standard charge. It just requires the application of a modicum of intelligence before a journey: how far do I need to go and is there anywhere en route I can charge if I need to? Sure, with a range of about 90 miles on a full charge, you’re unlikely to be contemplating trans-Siberian jaunts, but within the confines of a town or city, most trips will be fine. During my week with the i-MiEV, I drove over three miles with the range indicator displaying a pessimistic looking – – – on the display, so it clearly has a ‘reserve’ of sorts. The fact that EVs are so very quiet is essentially something of a non-argument. 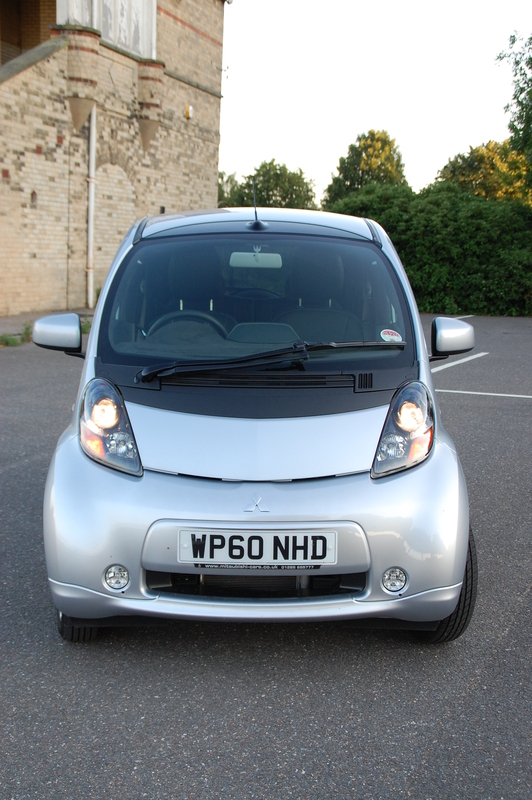 Hearing is only one of the senses we uses as drivers or pedestrians and despite it being a diddy little thing, the i-MiEV isn’t invisible. If people are prepared to simply walk out into the road without even bothering to look (and yes, I had one of those), then frankly, they need to be more careful. Additionally, there is no official price on a replacement battery pack but the i-MiEV has a five year battery warranty for peace of mind. 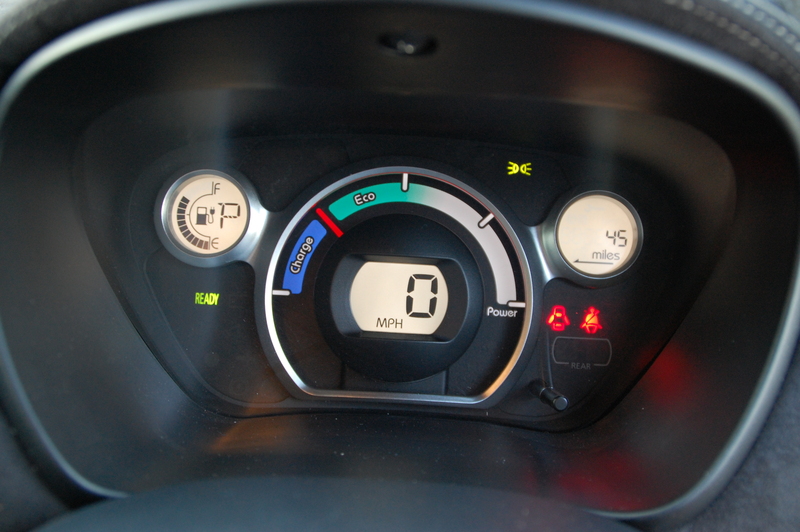 Charging the i-MiEV is another painless and clean task. Behind the redundant fuel filler cap on the offside is the socket to plug the flex into the mains (the nearside one is for quick charging but there are no facilities to use this locally). Affix the end that looks like a 1950s hairdryer to the car and the other to your three-pin socket and hey, presto, charging is occurring, with an LED indicator on the cable informing you when it’s complete. If you can do it securely, then an overnight charge is obviously cheaper, the whole process from flat to fully recharge taking approximately seven hours. 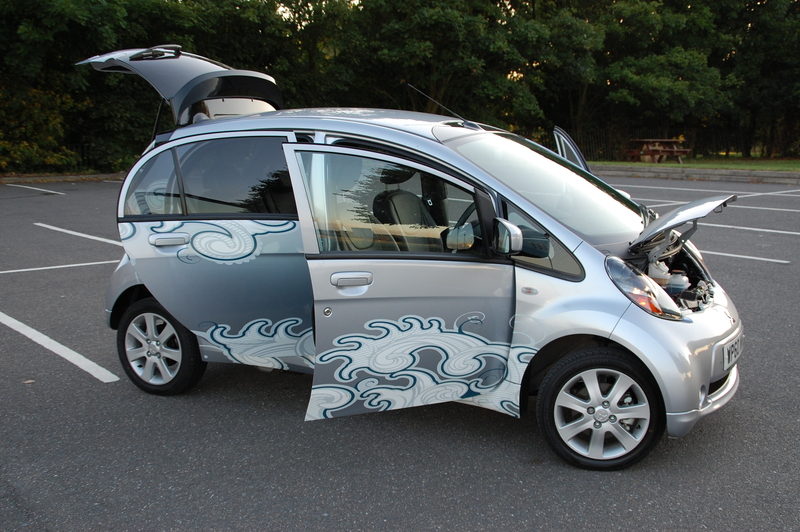 I said at the start I liked the i-MiEV a lot – that remains true. If I was to be asked would I buy one though, the answer would be no. For all its qualities: the lack of emissions at the point of use; the bristling full equipment list; the cuteness of the looks (yes, I like those too); the smile factor induced by that torquey off the line acceleration; and the fact as a daily car it would fit into my life well (rather than my life around it), I’m still getting a mild case of the EV-jeebies. And it’s mainly down to that eye watering retail price. Maybe the way to go might be to not sell EVs at all but to lease them – paying even a small premium per month to drive one over a conventionally powered small car would appeal and convert a lot of sceptical motorists. Car makers would have to work together though to make this viable. The limited range too is a factor and for me would necessitate the use of another car anyway. No, as I said in my recent Lexus CT 200h drive, I think the future will electrically and combustion-engined powered, in the form of plug in hybrids. Larger range of EV use would be perfect for city commutes while the conventional, small, refined engine will help re-charge the battery and permit larger scale travel. 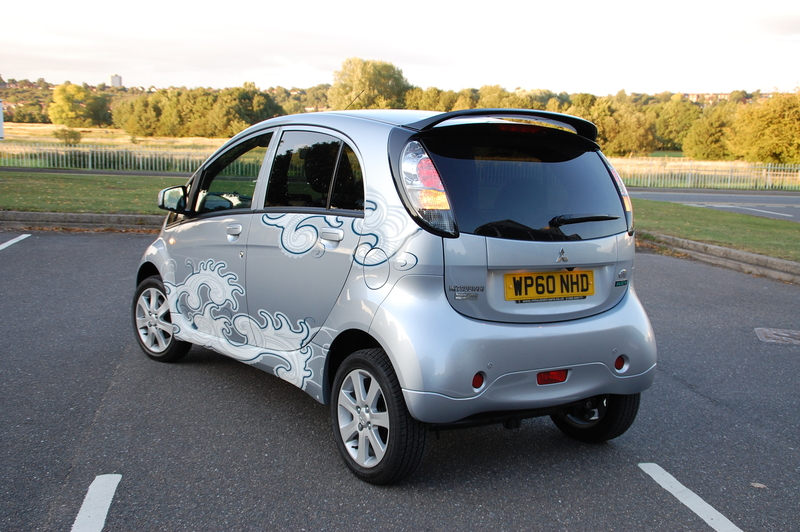 That said, I can see why someone would be swayed by i-MiEV’s charms, and as an urban-dwelling second, or city, car that can happily scoot off into the countryside, it fits the role well, if expensively. It’s just slightly too compromised for me as a standalone proposition.